San Antonio de Padua was built in a broad valley. The excellent farmland made it one of the most prosperous of the California Missions. The holdings included a kiln for firing roof tiles (the first in California), 17,000 head of cattle, a millhouse, a system of reservoirs and flumes for carrying water from the river, and even a room for teaching music to the Indians. Over time, the mission added a number of additional sites, including ranch buildings, corrals, and even a dam on the San Antonio river. The first recorded marriage in California took place at the mission in 1773, between Margarita de Cortona (and Indian woman) and Juan María Ruiz (a Spanish soldier). 1773 – The first officially recorded marriage in California, between Margarita de Cortona and Juan María Ruiz. 1863 – Mission returned to the Catholic church. Mission San Antonio de Padua is the most isolated of the California Missions, in the middle of the Fort Hunter Liggett Military Reservation about half way between U.S. 101 and California Highway 1. At one time the base gate was guarded, and photo ID was required to enter. The access road has now been rerouted so it does not pass through the secure entry. However, we suggest that you carry your vehicle registration, proof of insurance, and photo ID for each passenger, in case access requirements change in the future. Note that traffic signs and speed limits are strictly enforced by the military police on the base. 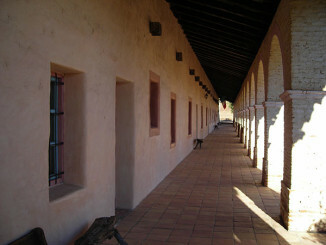 San Antonio de Padua is among the best restored of the missions. The church was reconstructed in1948 under a grant from the William Randolph Hearst Foundation. There are also several historical buildings, a small museum with artifacts, and even a remains of the original water control and irrigation system. The interior walls feature painted decorations done by the mission Indians, including an image of the Archangel San Miguel, with extended wings, behind the altar.. The “music room” shows musical notation and hand symbols used for teaching music. There has been no development of the land around the mission, allowing visitors to see the California “oak scrub” landscape much as it might have appeared to the padres in the 18th century. The mission’s columnata provides protection from the hot sun. 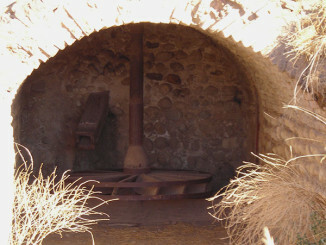 Remains of the mission buildings include a water-driven wheel used to power a mill. 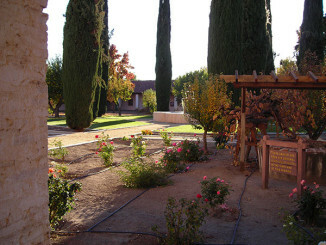 The mission gardens include grape vines from the original stock.